I saw Pirates, the newest one, and it was pretty good. 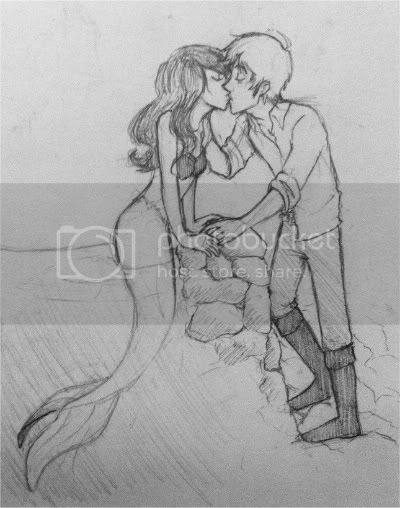 Greedy pirate would totally kiss a mermaid. Spoiler-y and such: But she drowned him at the end. no I was agreeing, I was saying her drowning him was a total mood killer. Haha. It was very ambiguous... we'll just pretend that she made him breathe underwater so they could make more kisses. Aah I'm sorry. This is seriously a problem I have. And It still looked suspicious. :I I couldn't draw a romantic pose to save my life, so I really really like this. Kissin' (one of) THE HARDEST thing(s) to draw. I guess that's a good thing. The little mermaid dies at the end of the original story. I think of this song whenever I think of murmaids. Whenever I draw a romantic pose it always looks clunky to me.